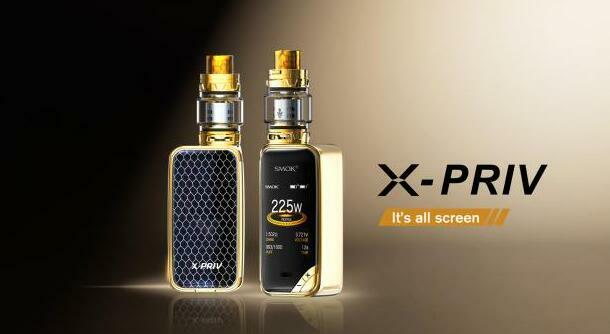 The X-Priv Kit is the latest device in Priv series by Smok. It has a beautiful design, a massive 2 inch HD display, a brand new interface, an ergonomic fire button, 225 watts of output and a myriad of temperature control modes. 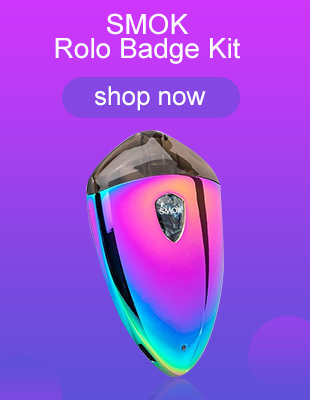 This kit is available in auto pink, black & red, prism rainbow, prism gun metal, prism chrome, prism blue and prism gold. Smok X-Priv mod measures 46.5mm x 30.4mm x 88mm, it is compact and portable. The design looks very high quality with glassy materials on the front and snake skin patterns on the back in a rounded form factor. The texture is soft and smooth to surely feel comfortable in the hand. The centerpiece of this new box mod is the 2 inch high definition screen that spans the entire front of the device. This allows for easy access to vape data as well as effortless menu navigation. The interface on the screen has also been updated to be more modern and includes vape statistics such as current power, temperature, resistance, voltage, puff counter, puff time and more. To easily change settings, there are several easily accessed sub-menus for power mode, temperature mode, memory mode and puff settings. The color theme of the menu can also be set to teal, pink, gold, red, white or green to match the mod’s color or whichever look your prefer. On the top you will find a standard 510 threaded connector. The lateral fire button is on the side and is integrated into the design for a stealth appearance while the adjustment buttons can be found on the lower right hand corner, below the screen. 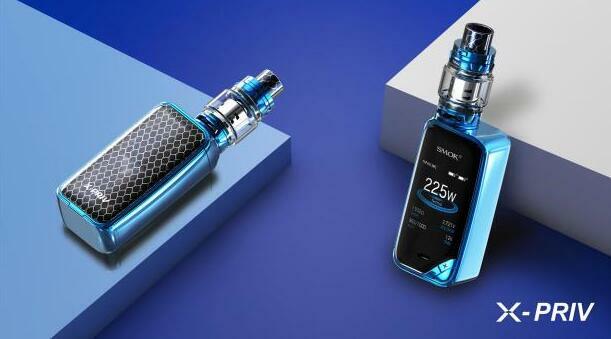 On the technical level, the Smok X-Priv kit has the same capability compared to its predecessors. It is powered by dual 18650 batteries that can be topped off via the micro USB port. This device can operate in variable wattage (power) mode, three temperature modes (titanium, nickel, stainless steel) and memory mode which looks to include TCR for entering resistance values. In temperature mode, the mod is capable of 225 watts of power with atomizers down to 0.10ohm and during variable temperature operations, the highest output is 600 degrees Fahrenheit with a resistance no lower than 0.05ohm. So many types of safeguards have been built into the hardware and software, so it can prevent the X-Priv from risky operation. This kit also supports firmware upgrades via the micro USB port in case Smoktech releases a new operating system. In addition, you can pick tfv12 prince tank to match X-Priv mod, it can let you enjoy a massive vapor.